Neat on the outside, great on the inside! 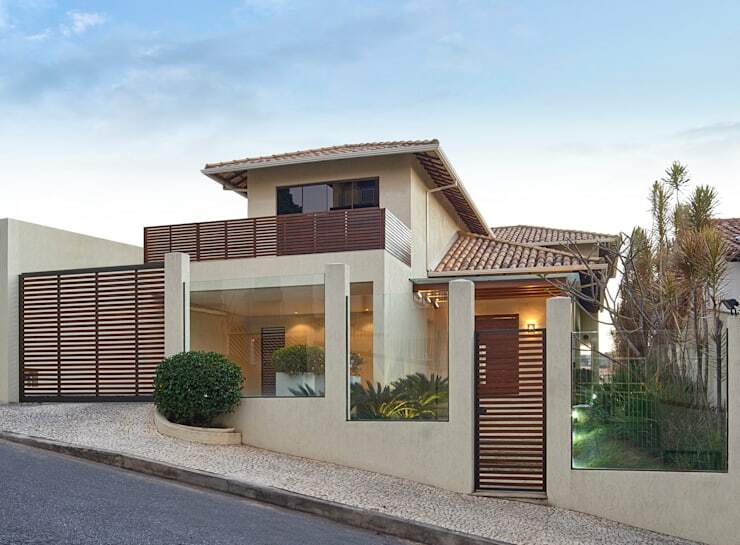 Isabela Canaan Architects have created this beautiful house on two floors, with a flirtatious yet tidy facade. The interior space, however, has a total wow factor with the spaces maximized! 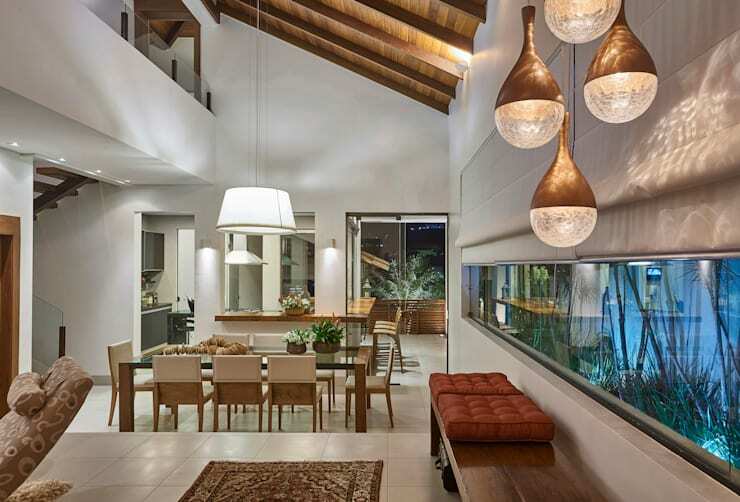 Let's begin a tour of this Brazilian house with its modern accents! The house is located on sloping ground. Because of this, the professionals were presented with the challenge of working with the space available to them. At first glance, the home looks amazing! The house is on two floors with a small garden, which opens up onto the entrance. On the left side, we can see a small corridor, which is designed to connect the front with the back of the property. The facade features wooden detail and a tiled roof, which provides character and rhythm to the exterior look and feel. The home features traditional elements with modern finishes. Don't you love the transparent glass that allows a little glimpse into the beautiful garden? The inside design is very expansive and open plan. On the ground floor, there are common social spaces such as the living room, dining room and kitchen. This bright, open space spills out onto the backyard. What is very noticeable is the elegant decor. The designers have gone for warm tones and colours like white, cream and brown—a very modern and contemporary style! The living room lighting, kitchen lighting and dining room lighting are very important features in this home, creating the beautiful, homely and warm space we see before us. The lights connect the entire space, despite their differences. We can see that there are all sorts of different lighting features throughout the home as well as a broad and expansive window, which allows natural light to stream into this space. The lighting fixtures complement the contemporary decor. Don't you love the orb-shaped bronze lamps on the left as well as the classic white lampshades that hang from the ceiling? The kitchen in this home is absolutely impeccable. 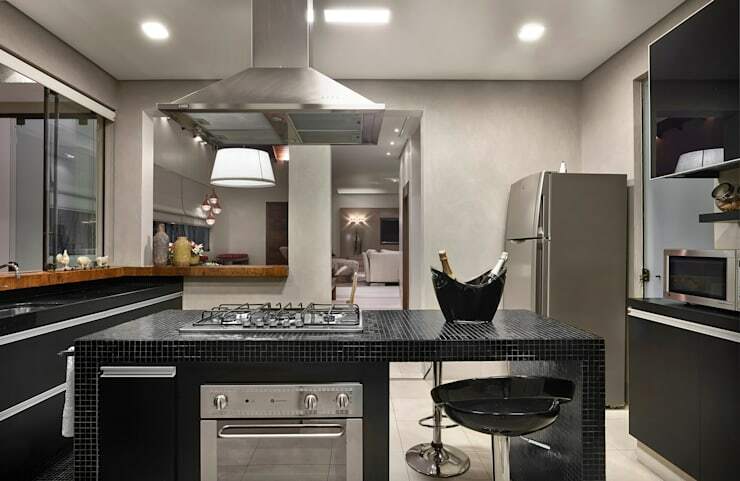 The cabinets are designed in a square, with black granite surfaces. This contrasts beautifully with the silver appliances. While minimal, there are also some gorgeous accessories in this kitchen. Have a look at these kitchen accessory must haves. 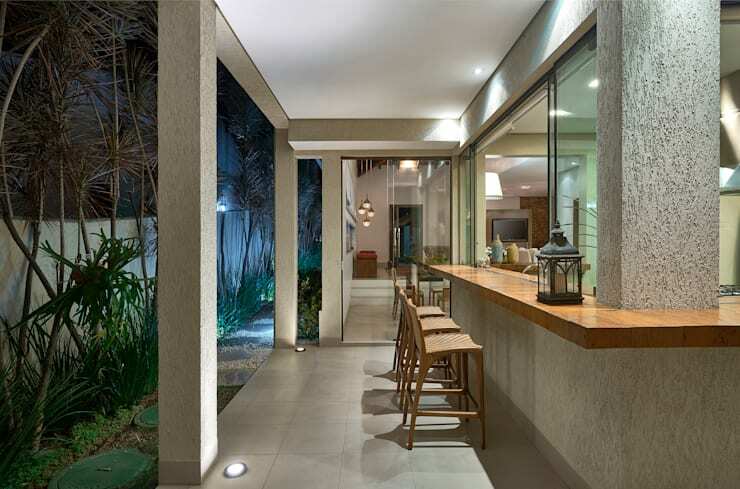 If we head onto the patio, we come across this very striking and smart bar design! An opening has been created between the kitchen and the exterior of the home, creating this ideal space. The opening features a glass sliding window, with both connects and divides the two spaces. This is the perfect spot for staying in touch with nature while having access to the interior comforts. 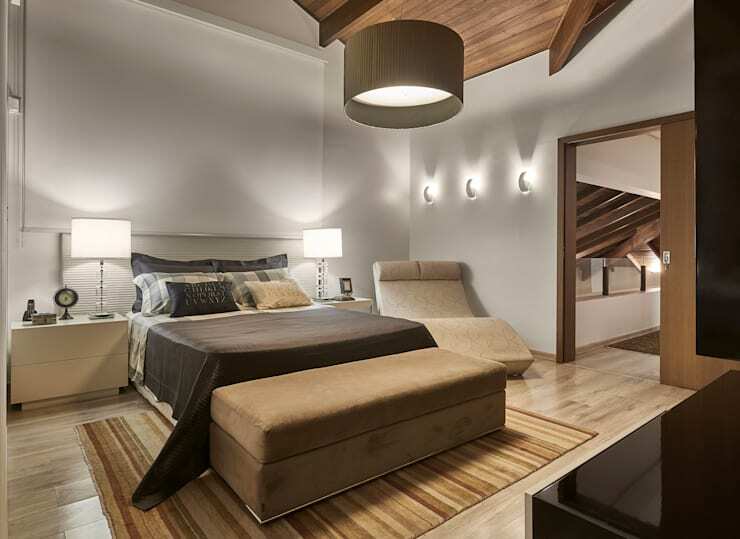 The bedroom is very sophisticated, with warm brown colours as the protagonist. Wood embraces this space, both on the ceiling and the floor, which is particularly charming. Soft textures, like the velvet upholstered chair, co-exist with the textiles in the room, such as the striped carpet, to create a very subtle rustic look and feel. Finally, we pop into the private bathroom, where we witness exquisite taste in decor. 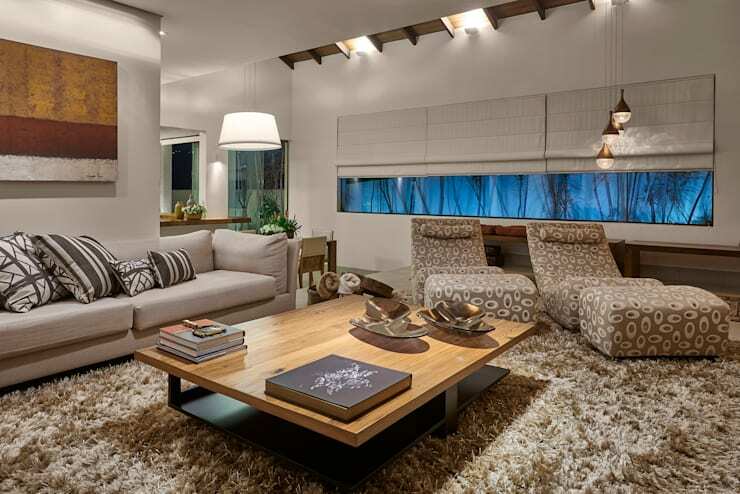 White and brown are the predominant colours in this space, enhancing the generous size and comfort of this space. The circular mirror is a true gem. 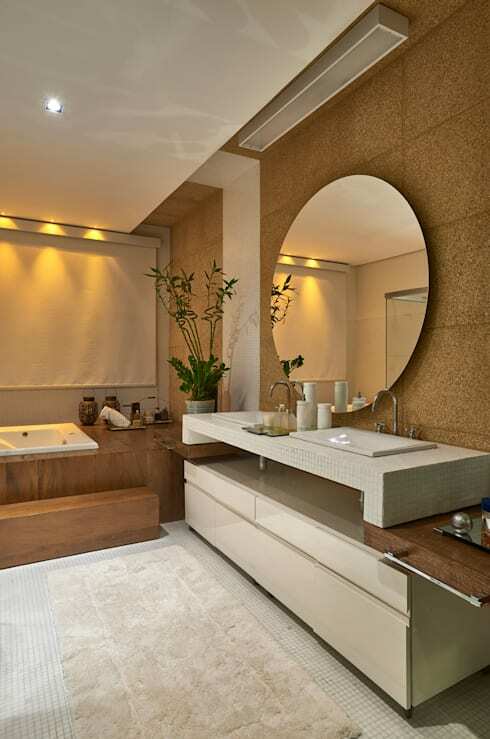 You should also have a look at these: Brilliant, beautiful bathroom trends.